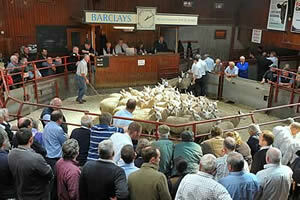 The Cumberland & Dumfriesshire Farmers Mart had forward 5,529 store lambs and breeding sheep at their sale at Longtown on Tuesday 16th November, 2010. Stores easily maintained late high rates. Top price of £75 for Beltex’s from Haithwaite; Texel £70.50 Plankey Mill, £70.20 Old Cambus, £70 The Bloch; Suffolk £70 High Crindledyke, £69 Moorhouse, £65.50 The Bloch; North Country Cheviot £70 Old Cambus, £64 Hownam Grange, £63.50 Moorhouse; Greyface £66 Heugh, £65.50 Blackhouse, £60 Crookburn; Cheviot Mule £62.50 Springwells; Charollais £62 Margaret Drive; Blackface £56 Heugh, £55 Albierigg, £54.50 Hott; Zwartbles £54 Easter Dawyck; Swaledale £45.50 Sheepriggs. Cast ewes to £62 Howahill, cast rams to £87 Wester Dawyck. The Hill Cheviots (2,012) were a marvellous show for the time of year, trade still very buoyant. Top of £61 Attonburn, £59 Lymiecleugh. Breeding sheep were forward in smaller numbers and met a ready trade with correct Hill Cheviots to £61 Lochguise, with Blackface ewe lambs to £69 Allensgreen.